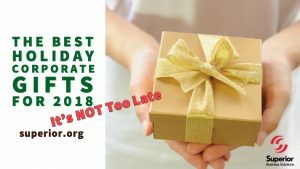 The approach of the holidays can bring feelings of excitement and thankfulness, but they can also cause anxiety as you try to figure out the right gift for every person on your list. Now with only days away until Christmas, the stress level can be high if you still have to send out your corporate gifts! But don’t worry because it is not too late…yet and you can always send out a New Year’s gift too. 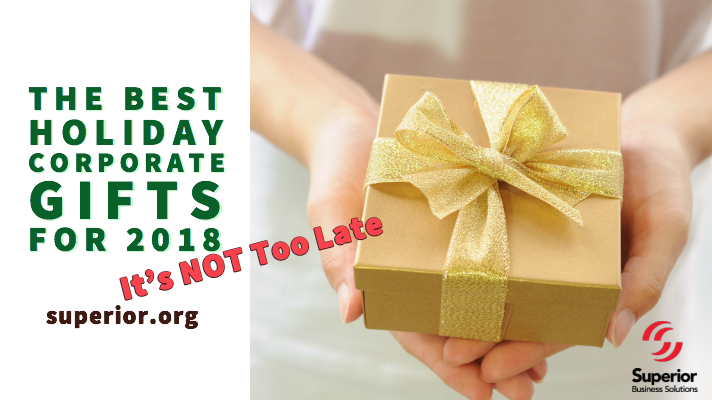 While there is certainly no one-size-fits-all approach to corporate gift giving, Tim English, VP at Superior Business Solutions, recently explained how to zero in on the best holiday corporate gifts of 2018. Every business has unique needs, as well as diverse offerings and that something special that sets you apart from your competition. With this in mind, it makes sense that you cannot send out some sort of cookie-cutter holiday gift. You need something as unique as your brand that speaks to your customers. Finding the right gift is a big decision. The perfect corporate gift will serve as a reminder of your brand for the next several months and maybe even years. It’s also worth considering the social media impact of your gift. It is very likely some of your recipients may take to social media to show their appreciation and give thanks for your gift. You need to make sure your corporate holiday gift is worthy of a social media post, but also something that will quickly and efficiently speak to your brand. Thinking of your corporate gift as the same item for everyone on your list can be a mistake. Your list of gift recipients includes a variety of people, from employees to customers, vendors and more. It may be worth considering different gifts for each group because a gift that does really well with one group, may fall flat with another. With this in mind, give careful thought to everyone on your list and choose a gift that will be appealing, useful, functional and hang in there as a constant reminder of your brand and a messenger for your branding information. Check out Tim’s full post to find out why pizza is a great analogy for the perfect gift, and possibly an example of an excellent gift. If you need help finding just the right corporate gift for any group on your list, reach out our founding brand, Superior Business Solutions. And ask them about promotional product management so next year, you will be ready EARLY for holiday corporate gifting because you had the help you need.